Dante Alighieri said a beautiful statement “Do not be afraid; our fate cannot be taken from us; it is a gift.” When I read this I felt that fate is a precious gift by God; and that gift can reach to anybody; sitting anywhere in the world. In a Palace or Slum. Indeed talent is a gift of God. Pearls come from the depth of an ocean, which we have witnessed it as well in our life by seeing people coming from lowest to going on top. Big names, stars and celebrities, they all are not born with silver spoon. Many of them are among us and few of them are even below than us. Few days back I saw a video of two gypsy girls singing an English song of Justin Bieber. I was amazed as so many people were, that local language songs are not easy to be sung by every person, on the contrary, an English song is actually very difficult to sing, and even for those people who can speak this language very well. A person who cannot read and write, which have no knowledge of basic English language or even Urdu language, can they sing a song so brilliantly? This question came up in my mind. 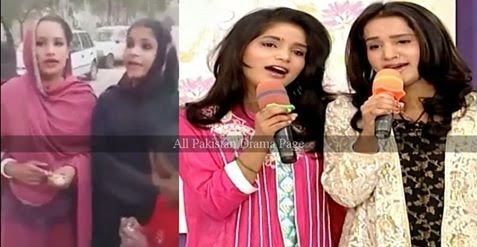 Two girls living in slum of Lahore were captured from mobile phone camera singing a Justin Bieber hit number ‘Baby’, with Garrwis in their hand and swinging with the rhythm. Their voice and confidence made that video shared multiple times on internet. In few hours, those two gypsy girls were famous around the country. We all were thinking do they know they are viral on social media right now. Few were feeling pity for them, as they are famous but do not know about it. Thanks to our efficient media, a national TV channel ‘Samaa” found them and brought them in front of people. They found, interviewed them, and brought their fame to a larger level. Everyone appreciated this effort of ‘Samaa’. New journey of Justin Girls later on named Justin Beebees started by just one appearance on national TV. Many Pakistani singers appreciated them and said to give them a platform from where they could start singing professionally. They became stars overnight and now many channels are contacting them to come and be part of their show. This was their fate and a gift from God. Recently they were seen on ARY’s morning show with Nida Yasir. Where the brats got full makeover, they looked so ravishing and excited after makeover. Their mother also sang on show and later on told that it was very difficult for them to memorize the lyrics, as they are unable to read and write but they somehow did it, for the love of music. Another T.V host Dr. Ejaz Waris from ‘Alite’ posted on his facebook page that Justin Beebees will be on his show very soon. ‘Nazarya Pakistan Council’ announced a medal for Justin beebes; in future we will see them on many T.V channels and hopefully they get some platform from where they can get launched. Teenagers Saania and Muqaddisa alias Justin Beebes feel their dreams of living a good and prosperous life will turn into reality soon, they thank to all those people who admired their rendition of ‘BABY’ song.